I am not sure what your history lessons in school included, but we did learn about the Battle of Gallipoli in school. Before I visited the Canakkale peninsula, I did not really pay much attention to it, but then I did some more reaserch into it. 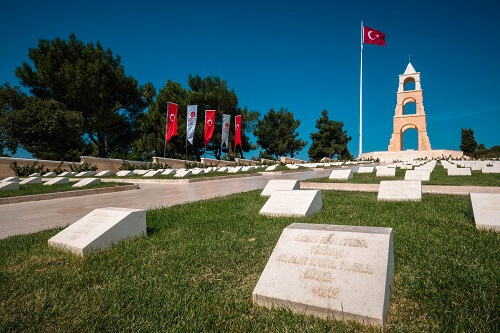 The Battle of Gallipoli took place at the Canakkale peninsula, so that is why the campaign is known also as the battle of Canakkale. 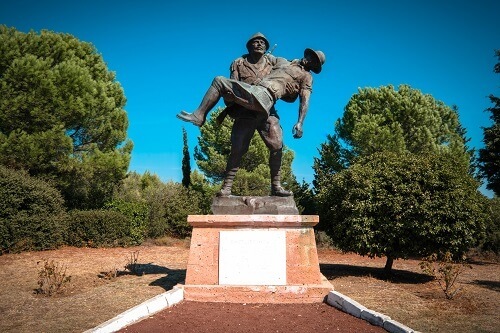 During our travel around Turkey, I also wanted to stop here and see the war memorials. Luckily our roadtrip did took as to Canakkale as well, so we spent few extra hours to see some of them. 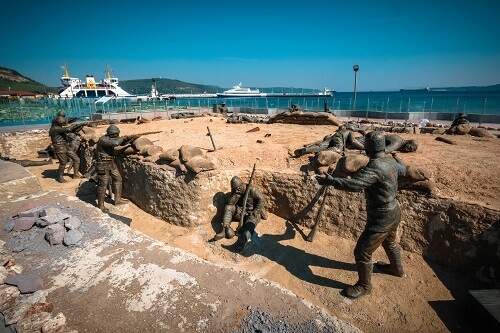 The Battle of Gallipoli was a naval attack of Allied powers, where they wanted to defeat the Ottoman Empire, gaining the sea route to the Russian Empire. The battle begun 18.3.1915 and ended 6.1.1916, where both sides lost many casualties. 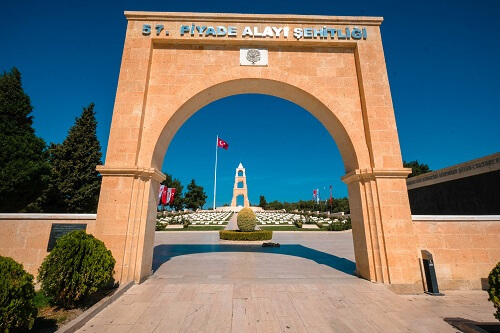 The Allied powers were mainly from Great Britain, Australia and New Zealand, so majority of tourist on Canakkale peninsula are either Turks or coming from UK, Australia or New Zealand. If you are not really keen on history, I would really recommend you to see the movie The Water Diviner, where you can also find out some more details about the battle. 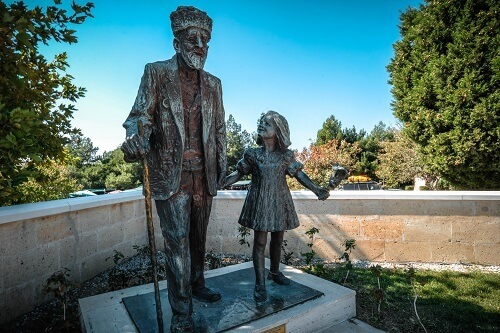 Being on the road with a baby, we did not stop much, but only visited few memorials on our way to Greece. But next time, when I found myself there again, I definitely will take more time for exploration. How to reach the Canakkale peninsula? You can reach the Canakkale peninsula from Greece (boarder Ipsala) or you can take a ferry ride from Canakkale city. The ferry ride takes around 10 minutes. If you’ll start your journey from the Asian part of Turkey, you need to embark on the ferry towards Kilitbahir (40.15161/026.40229). If you decide to visit the Canakkale city from the village Kilitbahir on the peninsula, the coordinates for the ferry port are 40.15357/026.37700. The easiest way to explore the peninsula is by your own transport. 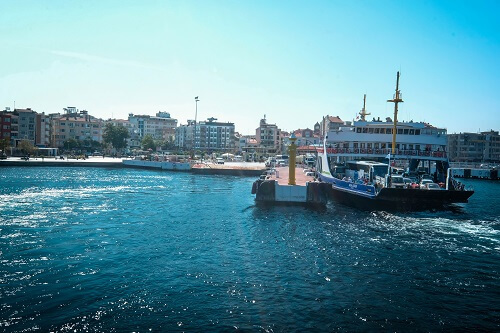 You can also visit Canakkale from Istanbul – first you need to take the fast ferry to Bandirma (1.5 hours) and then a bus to Canakkale (2.5 hours). What more can you see there? 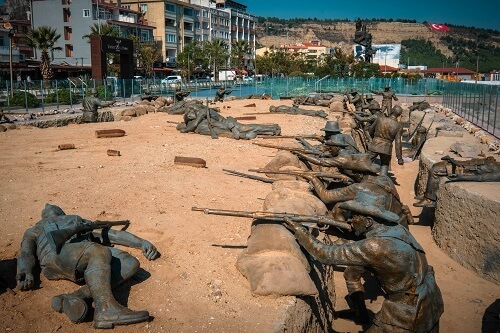 Almost the whole Canakkale peninsula is full of memorials of the Battle of Gallipoli victims. They are devided on different nationalities. An interesting stop is also the Military/War museum. 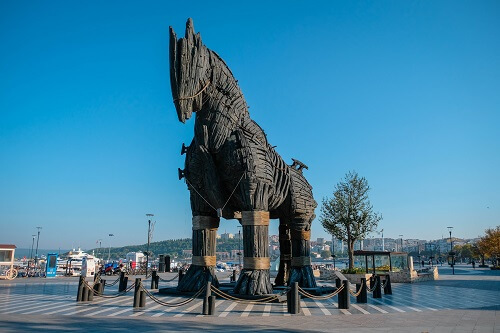 If you’ll already visit Canakkale, you could also see the Troy site or for many, maybe just seeing the Trojan horse from the movie The Troy will be enough – that one can be found along the sea promenade in Canakkale city center. Where to stay the night? City center has a good choice of hotels for every budget. Clean and decent double rooms with breakfast with a good review on booking (at least 8), start from 35 EUR/night. If that is your budget, we would recommend you to stay at Konak Hotel or Troia Ador Pan Otel.